Goblins Rush! : Cast your magic to protect the manacrystals… Rating: 3.5/5 Goblins Rush is intuitive and additive. 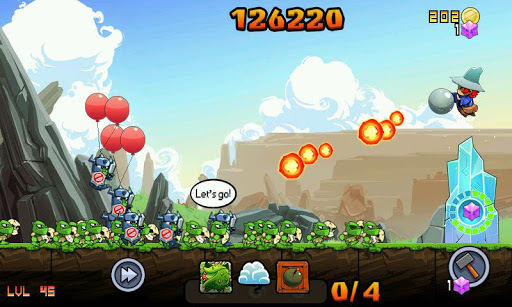 The instant action is different from the huge number of tower defense games on the market. It’s good for a short bit of play but unfortunately it’s repetitive and tires fast. I think only the time rich youngsters out there will be willing to keep playing to unlock all the features. Gameplay: This is a live action horizontal defense game where you’re a witch who uses magic to protect a big manacrystal from hordes of goblins. A quick swipe on the screen over a gremlin will swing him up into the air. If you think that just tossing them around is a bit kind and instead you can use your telekinesis to smash them into the ground. Of course that could seem like a bit too much contact for some and so you can tap on the screen to hurl fireballs and shine ice beams. The combination of fire and ice is enough to cause thermic shock to shatter the strongest opponents. Real time action: Much like in a real war, there’s never time to rest and the constant trickle of enemies headed your way. You need to dish out a flurry of spells to hold off the bandits and exterminate the threat. If you manage to win the stage then you get a star. Protect the manacrystal from incurring damage will earn you another star. Finally if you accumulate enough points (largely through multiple kills), then you’re earn that third pro star. All of this is for the classic long term replayability factor, but personally I think that the coins turn out to be more important in this game. Money, money, money: The gold stuff in this game drives a lot of things. It’ll unlock hats, orbs and pets to help you. As always there’s the precious second currency which in this case is purple gems. These are special and are used for the real upgrades of your character. In typical money rinsing fashion, non-stop game play will earn you lots of gold coins, but it’s the sparse purple rocks which will cost you real money (and properly power you). Overall there are 24 items to unlock and 24 runes to unlock through in-game achievements. You can upgrade your spells a huge number of times…. If you buy the purple stuff. Multi-mode fun: The classic “Adventure” (normal protection) levels are this game’s core, but as you get further into the levels you’ll unlock the survival and dark game modes. There’s a whopping 72 levels across 3 worlds which should be enough to keep most players interested. The game is generally marketed as action and strategy… but it’s much more of the former and unfortunately the gameplay tires fast. The overall feel: There are multiple gameplay modes and tons of unlockable accessories alongside the generally fun and destructive gameplay. But the difficulty levels aren’t really balanced and some stages are extremely difficult. If you don’t pass a stage then you can’t progress, and therefore you’re pretty much forced to go and buy more from the shop! Rating: 3.5/5 Goblins Rush is intuitive and additive. 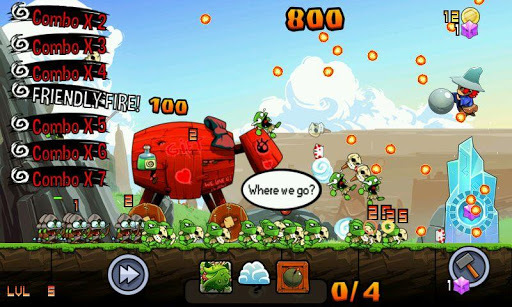 The instant action is different from the huge number of tower defense games on the market. It’s good for a short bit of play but unfortunately it’s repetitive and tires fast. I think only the time rich youngsters out there will be willing to keep playing to unlock all the features. As always with these games its not clear what to buy first. We’ve tried increasing the fire power to the first big bonus point, but eventhough you increase your damage, your enemies will get stronger anyway. The fire hurts the shielded goblins less, so we suspect it may be idea to boost your freeze ray first so that it’ll turn enemies to ice faster. The ice casting pet is useful in this regard but it can also cast the ice and slow at annoying points in time. Sometimes the pets are just a waste of money. Remember you can only equip one pet/item at a time, so try to focus your investments on things that can combine together effectively. Wanna rant? Feel free to tell us what you thought of the game! 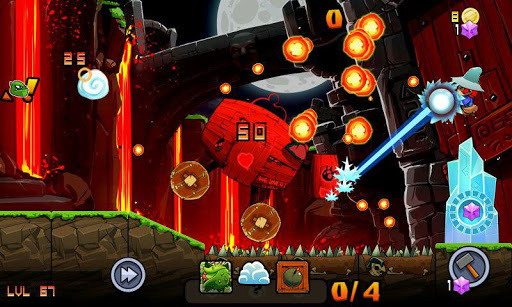 AndroidGamesReview.com is out to find the Best Android Arcade & Action Games and the Best Free Android Games for you to play on your phone. Visit us regularly to see our reviews of the latest indie games for Samsung, HTC, Nexus and other Android phones. If you ever get stuck with a game, then feel free to leave us a message or check out our game hints and tips. You can install apps from Google Play by scanning the QR code or clicking on the image link in the review page.